A team from the Northern Territory Geological Survey with the Department of Primary Industry and Resources deployed the first of a range of state of the art instruments in the Northern Territory (NT) designed to improve the understanding of geology hundreds of kilometres below the surface. 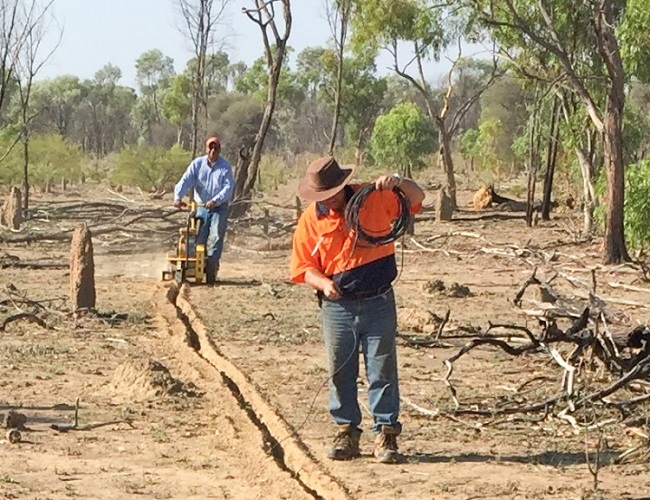 The team installed equipment at the NT’s first site in Daly Waters for the Australian Lithospheric Architecture Magnetotelluric Project, known as AusLAMP by digging trenches and laying wires as a trial to see how the deployment would work across the whole of the NT. The installation was the first of 500 sites to be established in the NT on a 55 x 55 kilometre grid. AusLAMP is being rolled out across Australia by Geoscience Australia, as part of Exploring for the Future, a four-year geoscience information collection program. An improved understanding of the geology and resource potential will assist the government in land use planning and provide geoscience information for resource explorers. For more information visit Exploring for the Future or AusLAMP.